NeoGeo games are coming to the PSN with online play at a fraction of the price they once demanded. SNK Playmore USA has announced that it wants to make your PlayStation 3 and PSP just like a NeoGeo arcade unit, but better. With the release of the NeoGeo Station on the PlayStation Network on December 21, 2010, the company will put 10 classic NeoGeo titles at gamers' fingertips and has plans for even more in the future. Nostalgia is the guiding factor here, because unlike other digital releases the games on the NeoGeo Station will be presented with "arcade perfect emulation," meaning exactly as they once were on the greasy machine at the mall. Thankfully, now you can play these games at home without having to pay $650 for a NeoGeo and $200 per game. 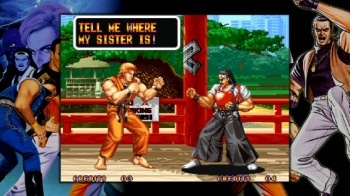 The NeoGeo Station will retain that arcade feel through online multiplayer support on the PlayStation 3, in both versus and co-op modes, while the PSP will support wireless ad-hoc for these features. It'll also add voice chat support, friend invites, a replay mode, and the ability to use save states. The games to be released on December 21 on the PS3 (with some coming later on the PSP) are a good start for the service, including Fatal Fury, Art of Fighting, Samurai Showdown, Alpha Mission II, King of Fighters '94, Baseball Stars Professional, Magician Lord, Metal Slug, League Bowling, and Super Sidekicks. Each game will be priced at $8.99 for the PS3 and $6.99 for the PSP. If you think those prices are high, I'll just point back to the cost of NeoGeo titles in 1990. In coming updates, SNK says it'll be adding titles that have never been localized before in addition to more titles the U.S. has already seen. Though it may have been expensive to own a NeoGeo, it was a significant part of gaming's history and can now be experienced in its original form again, man-sized fireballs and all.